Dear friend’s today we are going to introduce you to a new mobile application named “OurPact”. Which was born from the idea that responsibility can be taught through technology. Providing a realistic take on parental controls, OurPact allows parents and children to use the world of mobile to strengthen their relationships through communication and compromise. This mobile phone application is a leading parental control application for iPhones, iPads, and iPods that makes it easy for you to set limits on how much time your children are spending on their mobile devices. With the help of this application you can Create schedules or block all Internet connection and application use at a moment’s notice or reward them with the allowance feature. This application will help you balance the risks and rewards of iOS and Android technology for your family, with ease. Now a days most of the users Downloading applications and mindlessly wasting hours on games is designed to be addictive. Because of this, it’s important to have some measure of control so your children don’t grow up glued to their devices. Ourpact application parental monitor dashboard keeps all of your children’s profiles in one easy-to-access location. In addition to defining reasonable schedules for use with each of your children, OurPact also opens dialogue about important, modern concerns, such as social media and reputation, how to deal with cyber-bullies or even issues surrounding explicit content. As you know Parents direct involvement in their children’s mobile habits has proven to be a key factor in children’s healthy approach to technology. 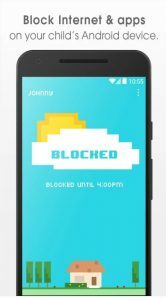 Encourage or block all mobile application and Internet access at your own parental discretion through OurPact’s schedule dashboard or block/allow feature. The application developers encourage families to work together to create balanced schedules that fit each family members unique routine. Android Parents have the ability to access the OurPact web portal from any internet enabled device. Sign Up for Free Today.